I have been working hard the last two days building my server. Things are now coming together quite nicely and Flynn (the Sun Enterprise-250) is starting to come to life. It was touch-and-go yesterday. I could only get one CPU to work. After swapping the two CPUs back and forth a couple of times, I got it working. I was also having issues with memory. I thought I had a full 2 gig to put in, but all I had was 64 meg sticks, which brings it to a max of 1 gig. Oh well, good enough for now. 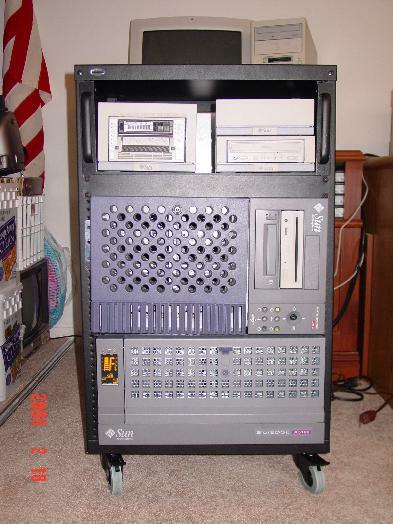 I was chatting with my friend Chris online about the system when I realized I had a bunch more stuff in storage, like a SCSI DVD ROM and a SCSI CDRW. I made a quick over there to find that I also had eight sticks of 128meg RAM! AWESOME! I replaced 8 sticks of 64meg with the ones from storage, dropped in the DVD ROM and found a chassis for the CDRW, even move the DLT from my Ultra-60 over, and voila! I am now getting the disk mirrors built and securing the OS. I should have it in full production by next weekend. (insert evil mad scientist laugh here) Remember, Mom taught you to use your powers for good, not evil!